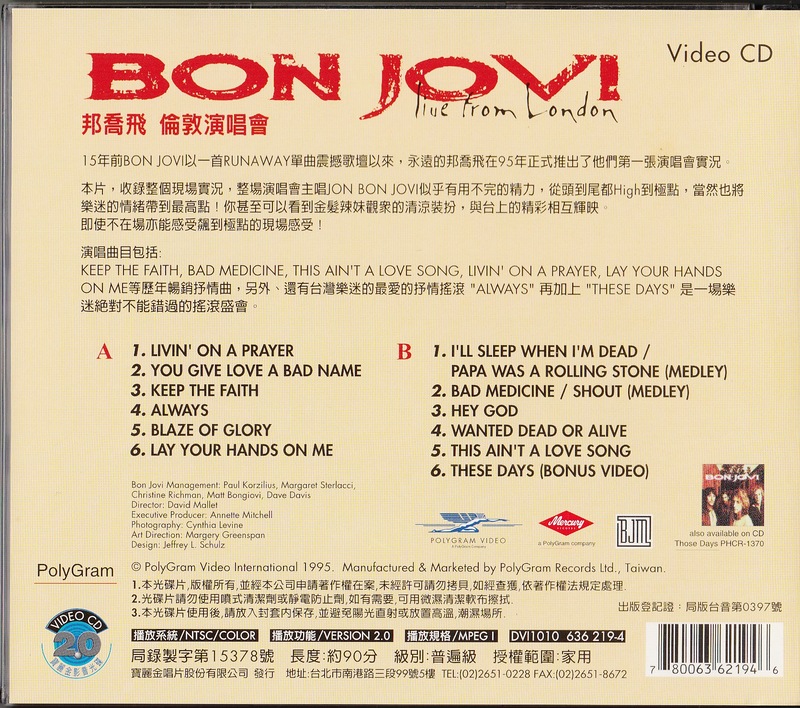 VIDEO CD, TAIWAN edition. 2 discs. 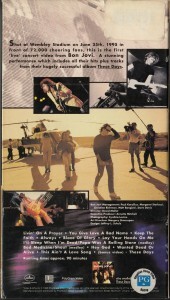 With OBI cover to the back. 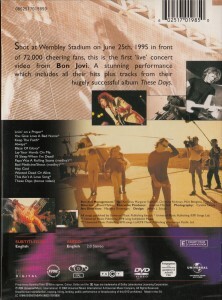 Shooting at WEMBLEY STADIUM, LONDON, June 25, 1995. 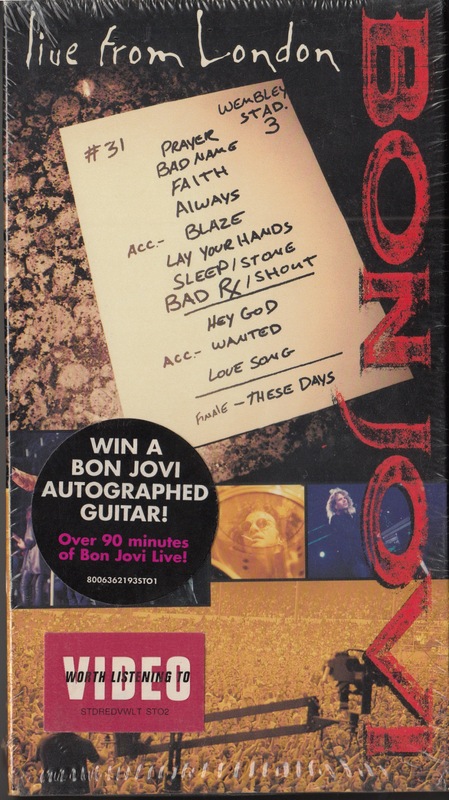 DVD, Argentina edition. 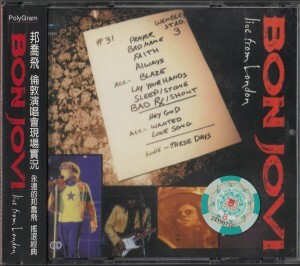 Back the upper part of the design is different from the plastic case version of the other countries, there is no image of the background. 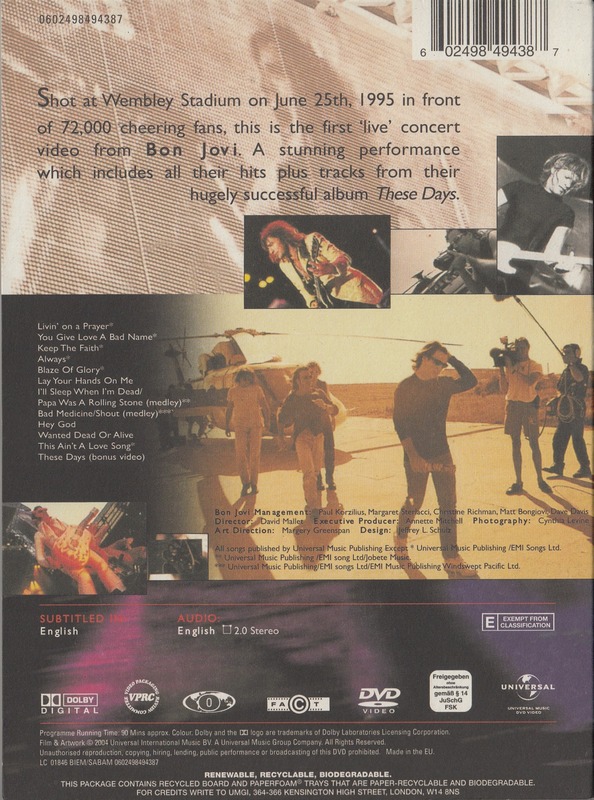 Re-released in later years, “THE BEST OF DVD LIVE” and printed seal is affixed. 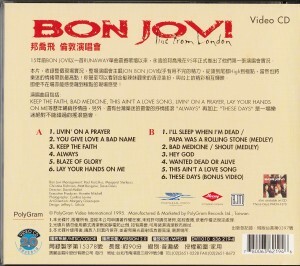 Also seal to indicate that in the back with the “Industria Argentina dvd hecho en taiwan” means disc is made in Taiwan. 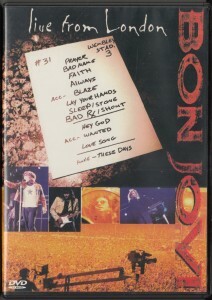 DVD, Argentina edition. 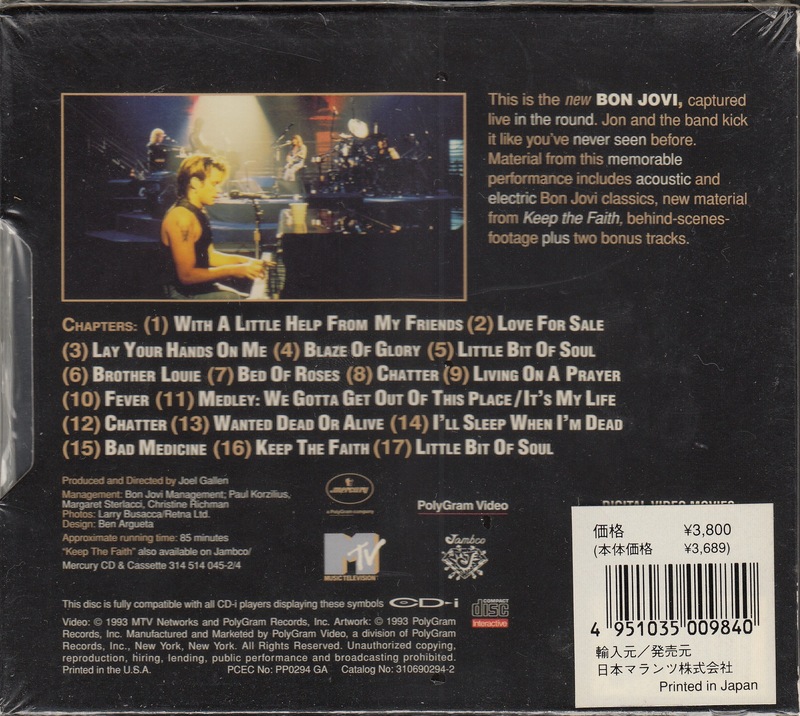 Back the upper part of the design is different from the plastic case version of the other countries, there is no image of the background. Also on the upper right bar code is described as “Industria Argentina”. 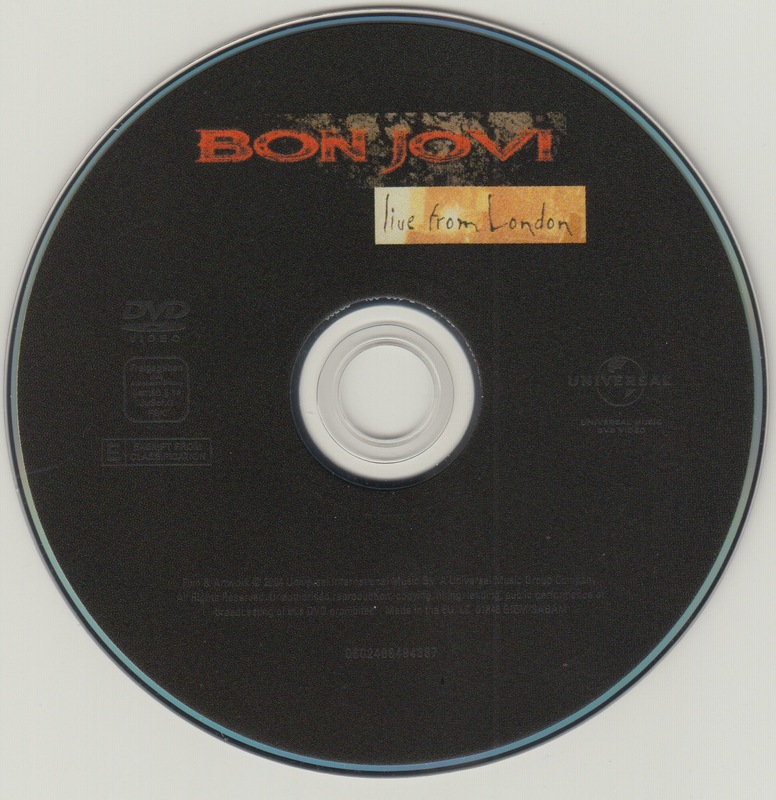 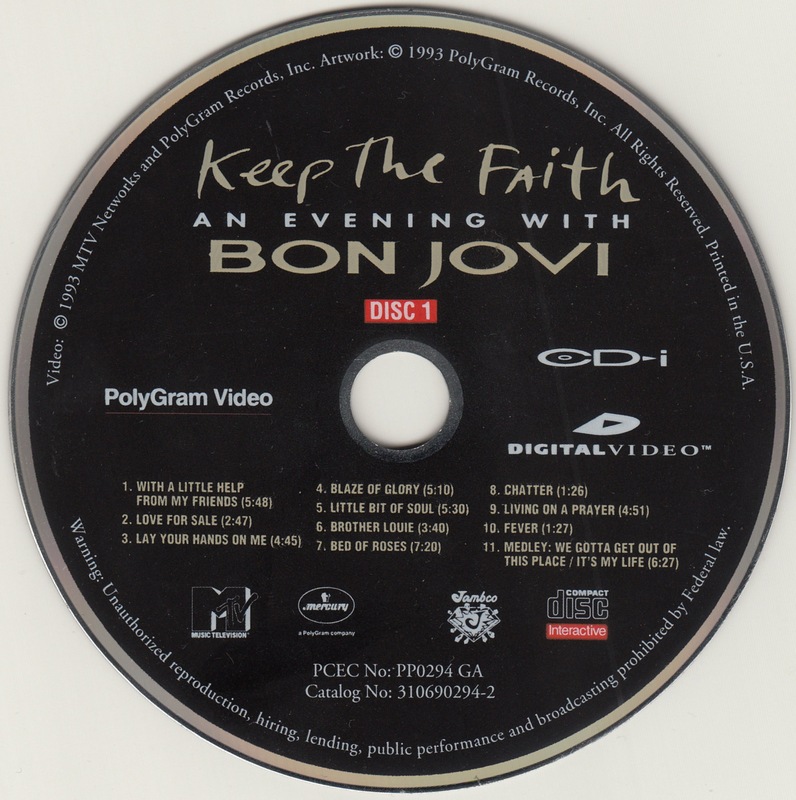 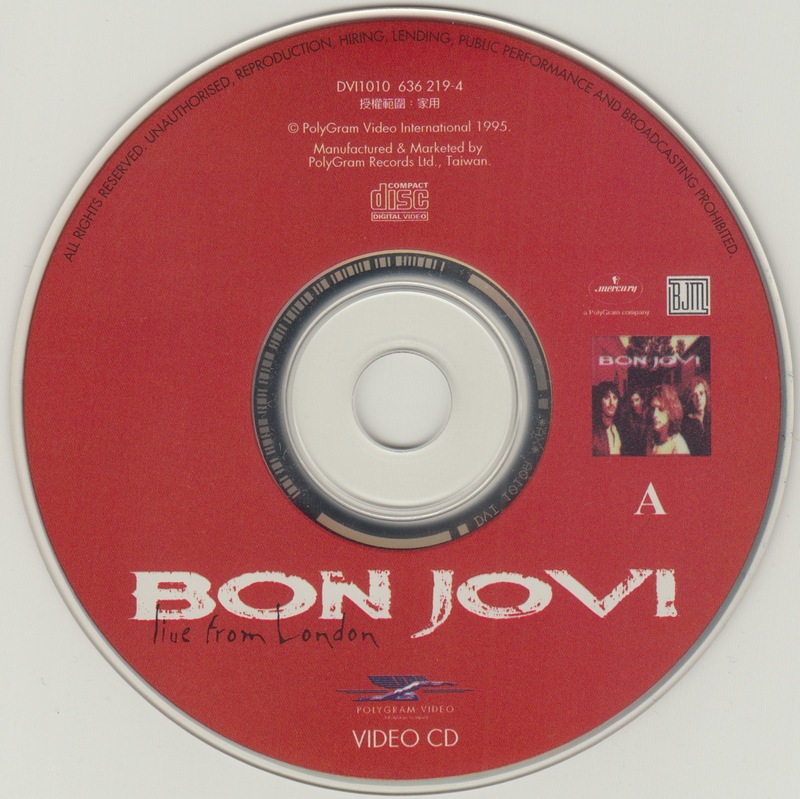 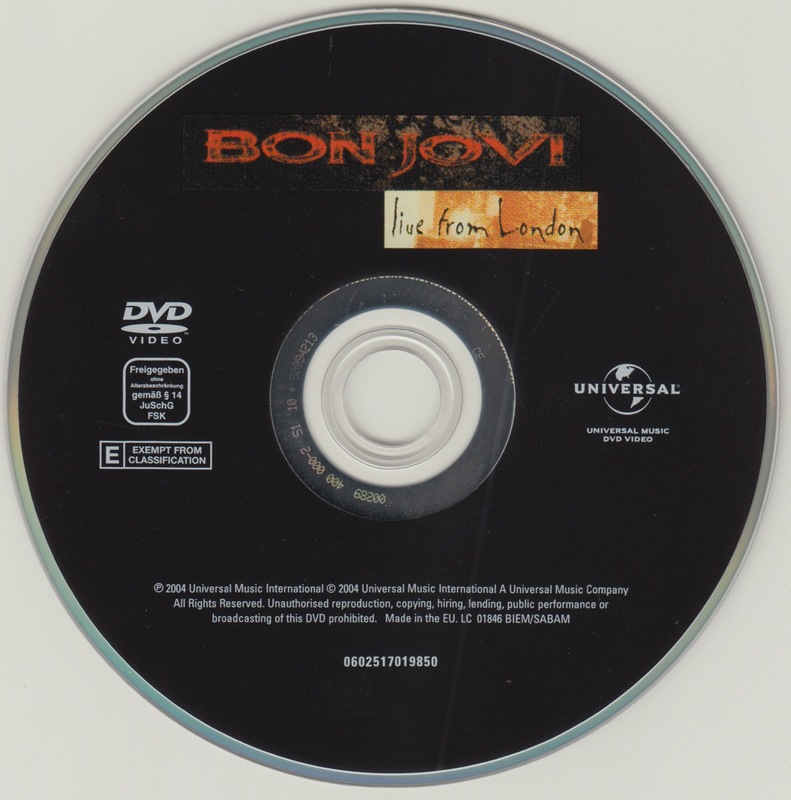 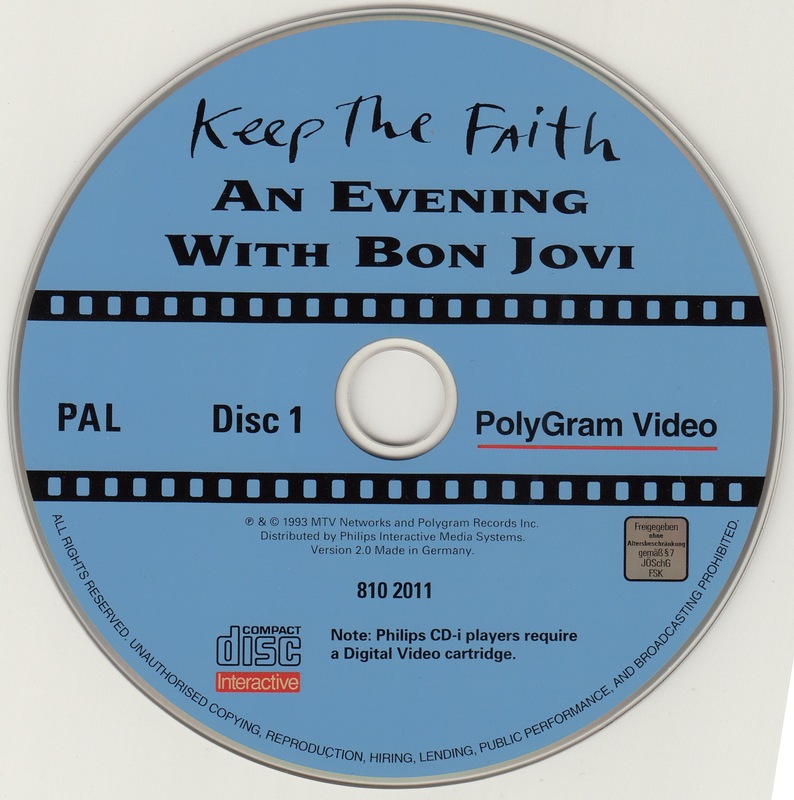 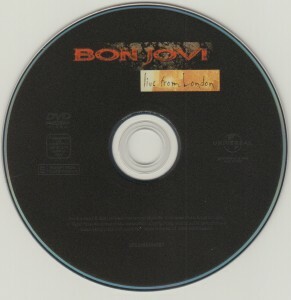 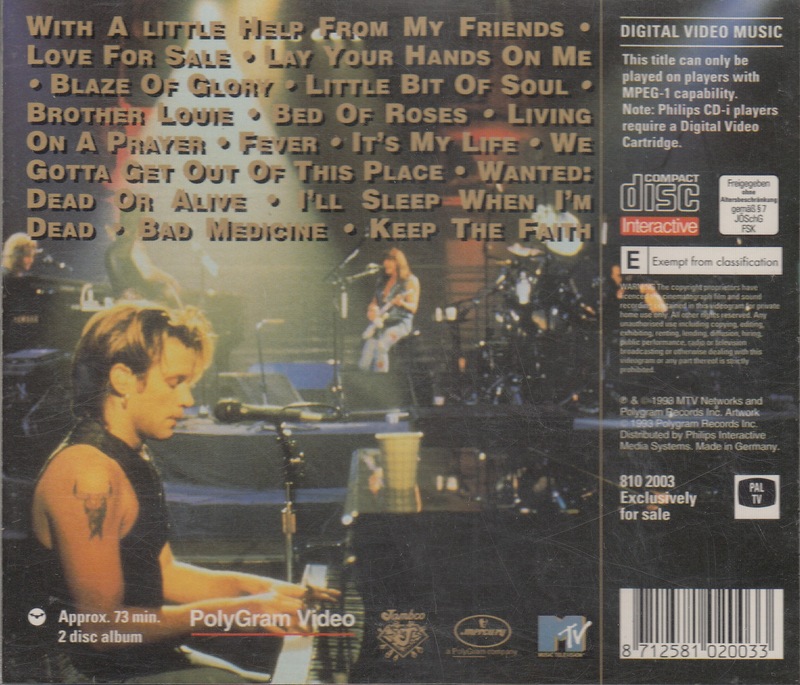 Red BON JOVI logo on the disc. DVD, EU edition. Eco-type case. DVD, UK edition. 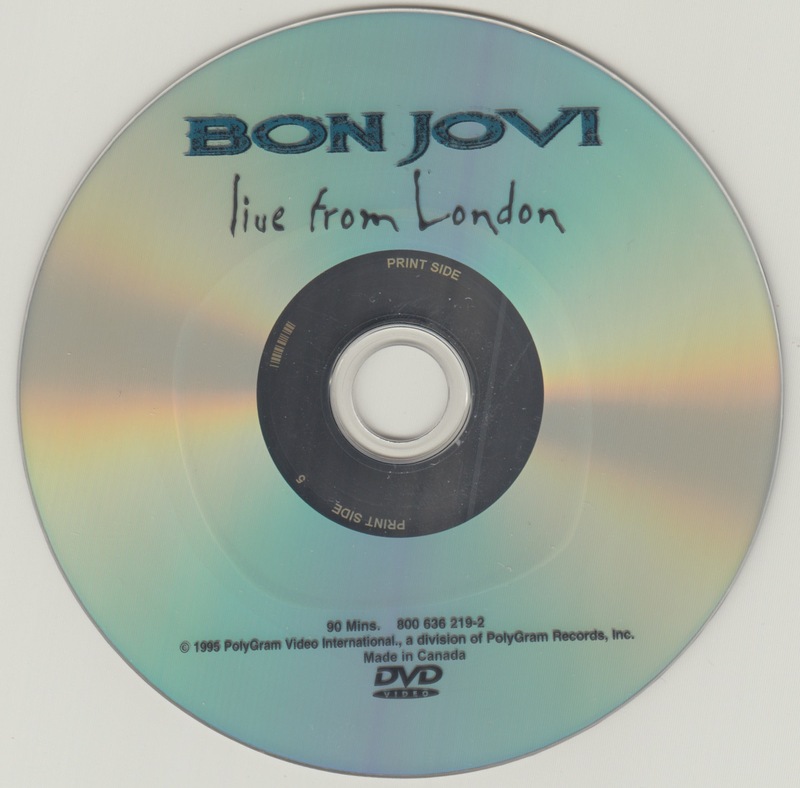 Matte paper case and matte disc. 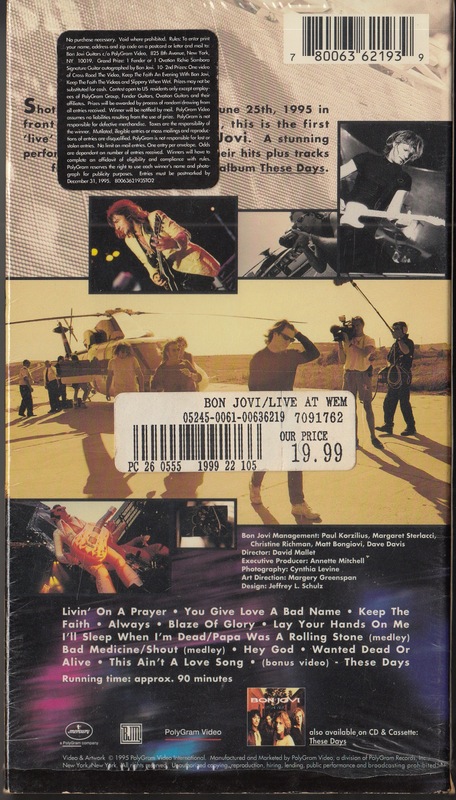 DVD, U.S.A. edition. 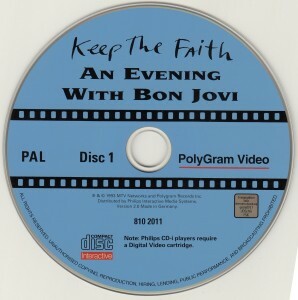 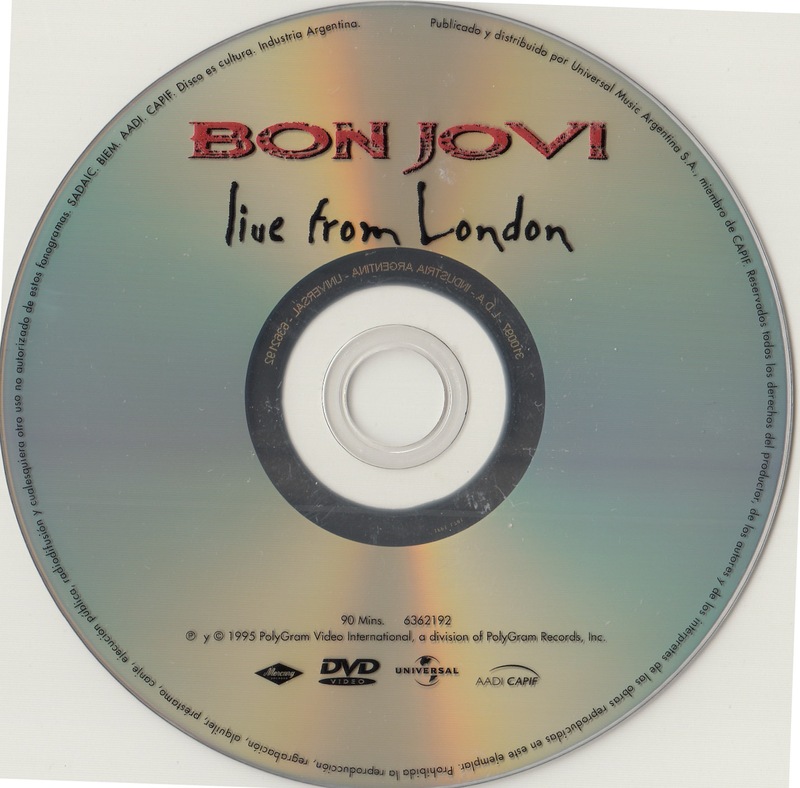 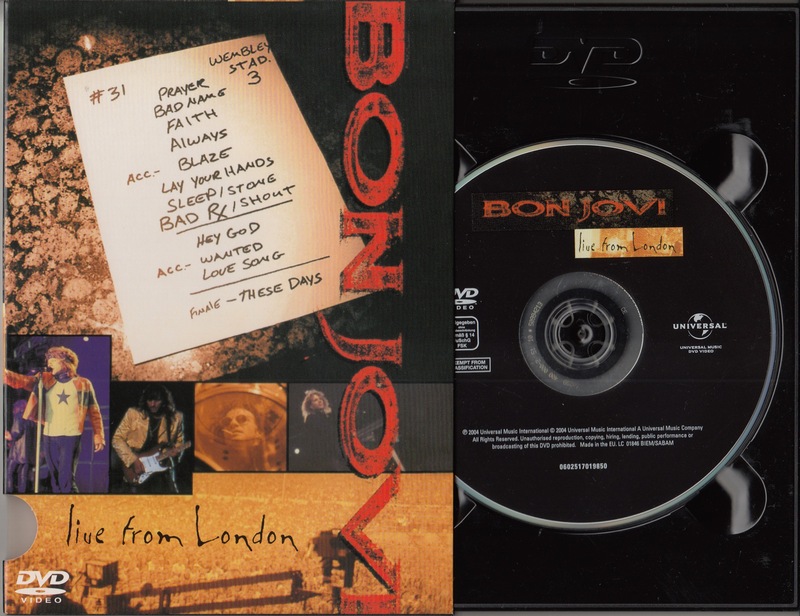 Blue BON JOVI logo on the disc. 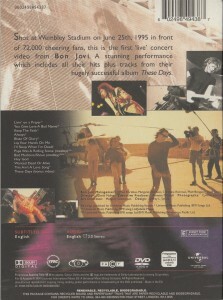 VHS video, CANADA edition. 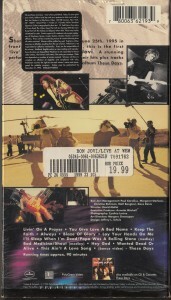 Title printed portion of the video tape is different from the USA edition. 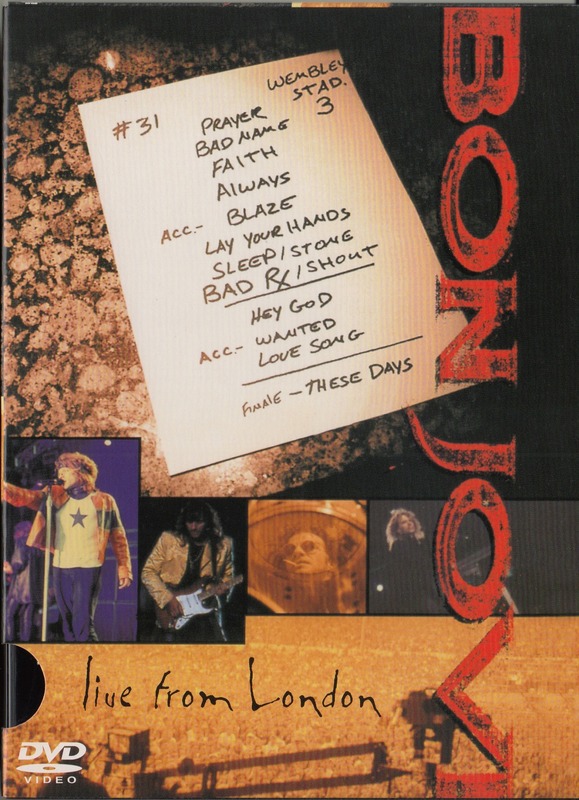 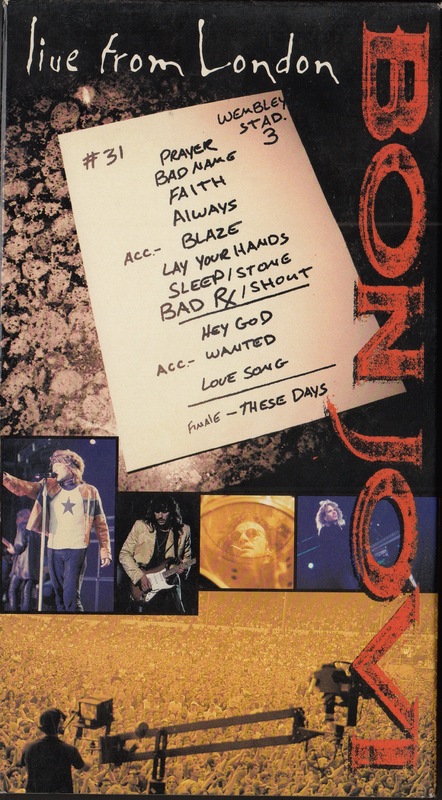 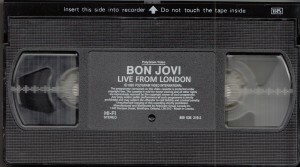 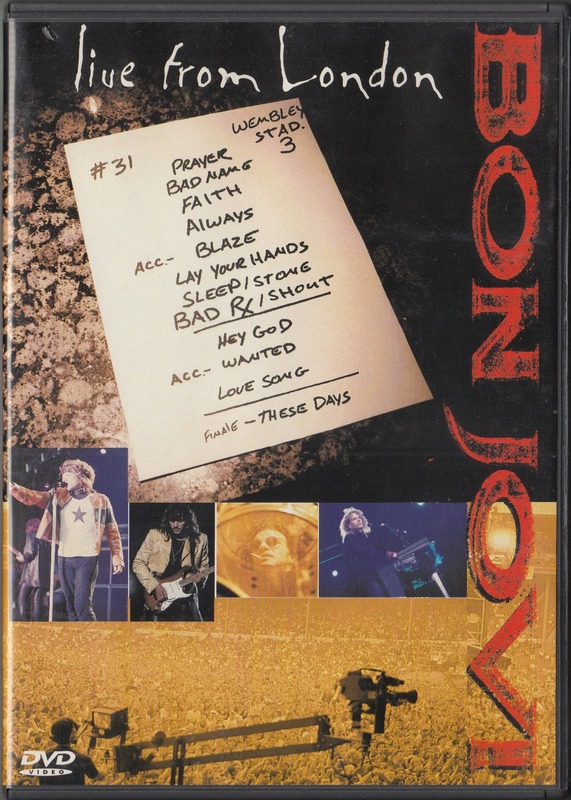 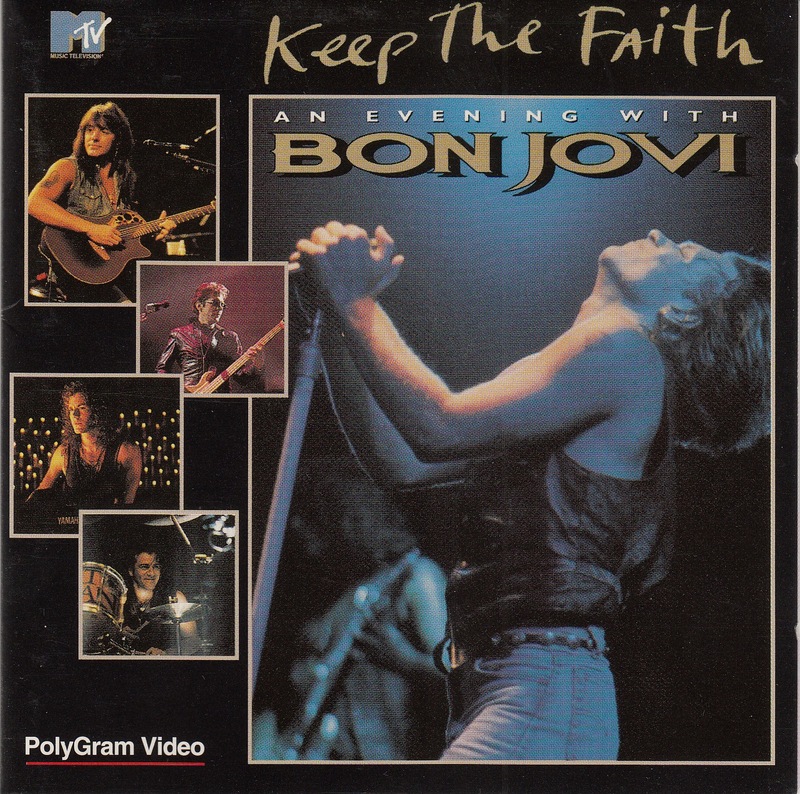 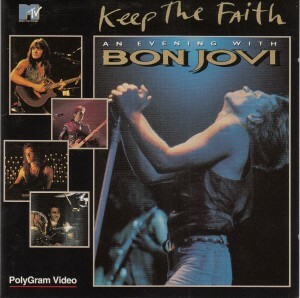 VHS video, USA edition with application ticket for BON JOVI autographed guitar. 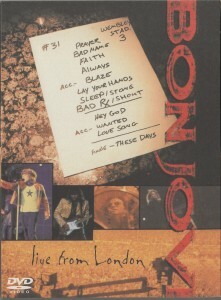 Shooting at WEMBLEY STADIUM, LONDON, June 25, 1995. 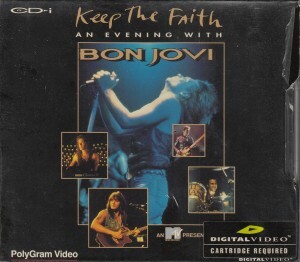 It was released in the playable media CD-i in the CD-i player. 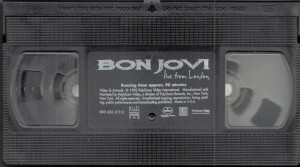 With paper case. 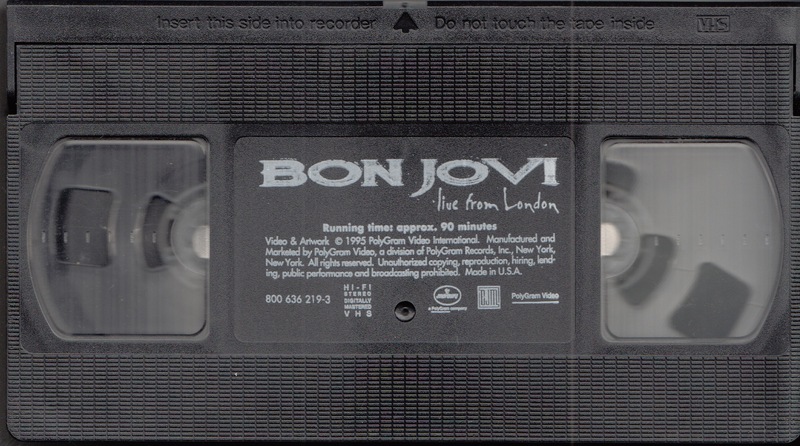 October 24, 25, 1992 it was recorded in KAUFMAN ASTORIA STUDIOS, NEW YORK. 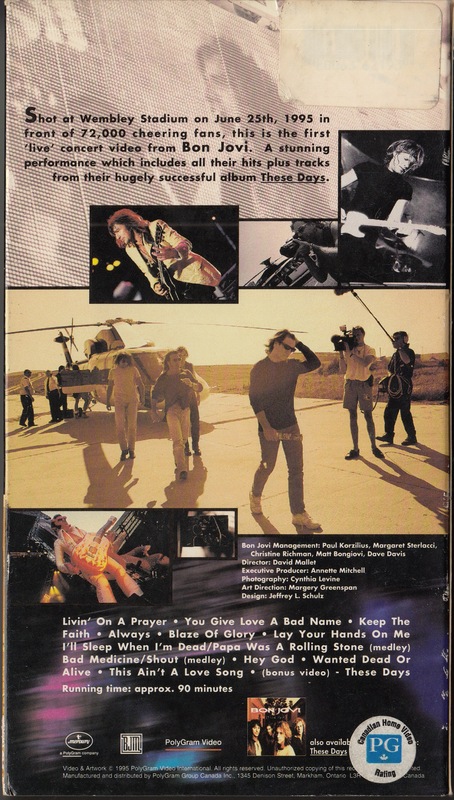 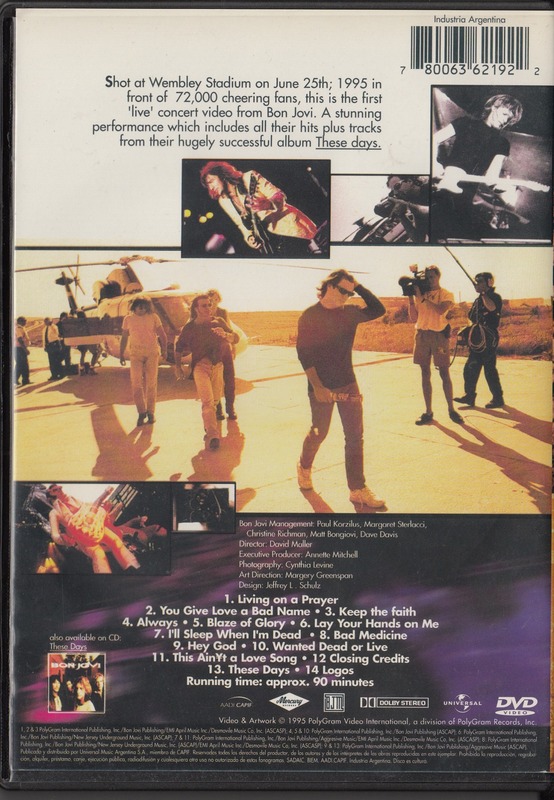 Germany edition includes, front and back jackets and CD label is different from the U.S.A. edition, and the distribution of the song has been recorded different. 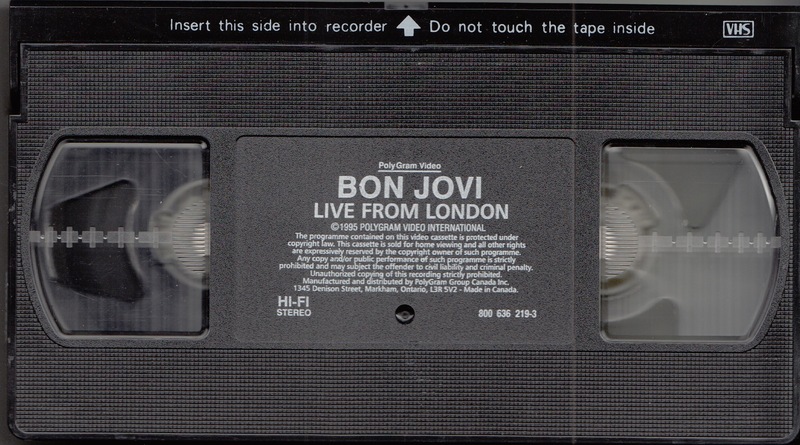 Although it is not credit, end roll flowing Little Bit Of Soul, which has been recorded at the end of America board as well. 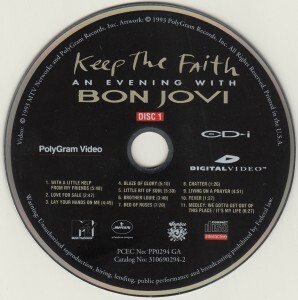 Released in Japan in seal is affixed to the U.S.A. record.